I am sorry, but for some reason did all the text disappear and I have to rewrite it again. *sigh*.. 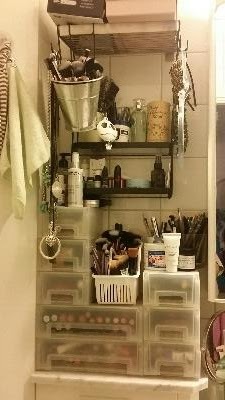 But this is my storage for makeup that I have beside my bathroom mirror, I will just write about the stuff that are hanging and what kind of storage units I have used. So here we go again..
First I have a IKEA dish rack hanging on the water pipes on the wall, And under that I have IKEA spice rack hanging in hooks from the dish rack and on some hooks I have big necklaces and a hand mirror hanging. And the white plastic media storage is IKEA Kupol. 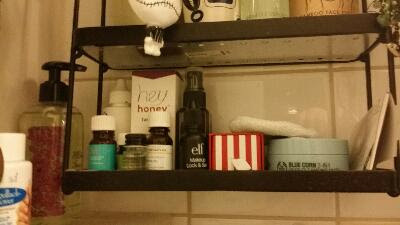 On the top shelf on Kroken I have some hair brushes, eye shadow stick (don't use them that much), Body Shop Perfume "Green Tea Fuji" and some facial oil cleanser. On the bottom rack I have some nail stuff, different kinds of Argan oil, and facial products. 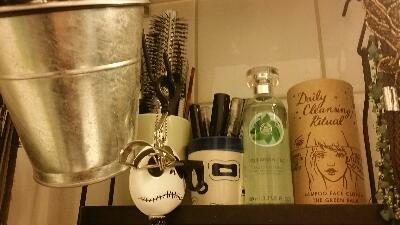 The bottle in the corner is a hand soap and the little white container in front is a nail polish remover jar. 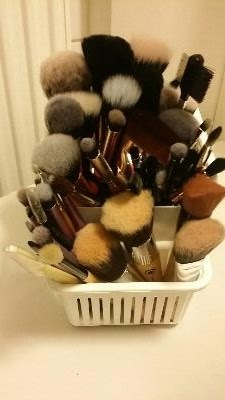 My brushes I have in a common cutlery holder that I bought in the supermarket. I will talk about my brushes in an other part so you just have to wait for that. And in the silver metal pot hanging from Grundtal I have some brushes that I don't use as much, but still can't be without, and of course a small hand mirror with Jack Skeleton, just cause it's cute.